Exercising the muscle of courage. We can influence the world even though we’re afraid. This was the case for Francis Scott Key, an American attorney, who had an important role during the War of 1812. The war had lingered on for two years. The Americans had been defeated during the Battle of Bladensburg, which led to the burning of public buildings in Washington, D.C. The British were fighting, both on land and on sea, to invade Baltimore, Maryland. Mr. Key and Colonel John Stuart Skinner were invited to board a British ship to negotiate the release of three prisoners. 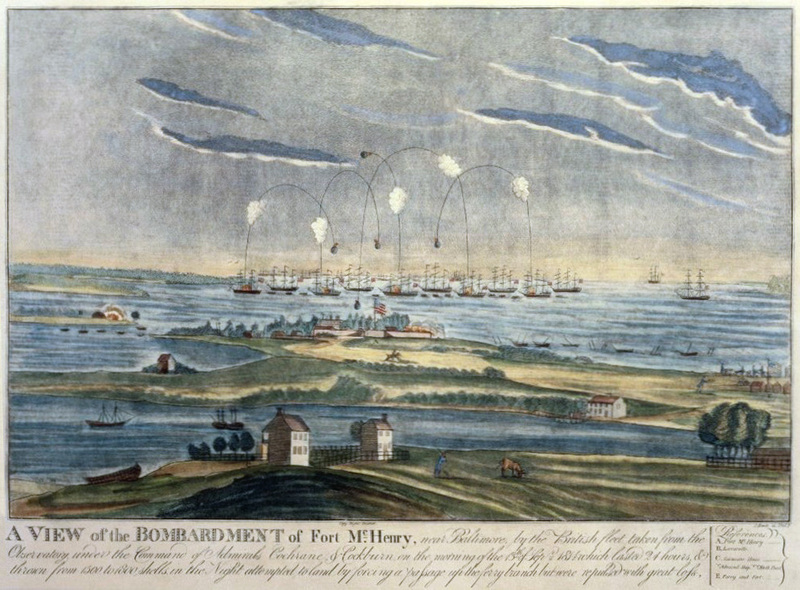 From the ship, Key watched The Battle of Baltimore take place. He was not allowed to leave and the war raged on for 25 hours. At dawn, through clouds of smoke and fire, Key could see the American flag still waving at Fort McHenry and he reported this to the prisoners below deck. Eventually, he was released, and on his way back to shore, he was inspired to write a poem about the scary and amazing experience he had just endured. In due course, this poem was put to music and this popular song was then played during military occasions and celebrations. During WWII, the song was performed at the beginning of every baseball game and this practice become an American tradition. In 1931, President Herbert Hoover signed a law adopting it as the national anthem of the United States. Although shaken up from all that he’d witnessed that day, Mr. Key found the courage to scribble down the lines of a poem, and new traditions were born. O’er the land of the free and the home of the brave . . . Someone tells me at least every couple of weeks, “You are brave.” I don’t really feel brave, in fact, I feel afraid much of the time but it doesn’t matter; my vision and my hope is bigger than my fear. The “fear of the unknown” is the worst kind of fear. Our imaginations can run havoc inside our heads. I have found that once I learn about my fear, and examine it, the fear lessens. Ignorance often contributes to our fears, so I’m always working towards being informed on topics that I’m fearful about. Research your questions and ask for help from people that have confronted the same sorts of fears. Find a community of encouragers. If the advice you receive is coming from a place of cautionary fear, and if you’ve evaluated the situation to a point that you feel comfortable with the possibilities, jump. It is also okay to decide, after evaluating, NOT to do something. Do what feels right for you, but be honest with yourself. C.S. Lewis said the “Peace is not the absence of conflict, but the ability to cope with it.” In the same way, courage cannot be seen as the absence of fear. Fear, or the possibility of fear, will always be there. It is easy for our dreams and goals to collapse if we allow fear to rule. Certainly it is good to be cautious, but taking the path less traveled can lead to fantastic results. You can’t change the world or influence others by staying in your comfort zone. Being brave is an active decision and it takes practice. Why not start now? I have found that instead of allowing the “what ifs” and negative chatter to take up residence inside my head, I make steps towards my courageous choice, as if it has already happened, or IS happening as I act upon the choice. You must constantly turn your imagination to visualize the future within this courageous choice. Also, be aware and notice the consequences that line up as you act upon your courageous choice. Doors start to open, while others start to shut. Are you ready to be brave? Eleanor Roosevelt said, “You gain strength, courage and confidence by every experience in which you really stop to look fear in the face. You must do the thing you think you cannot do.” She also said, “The purpose of life is to live it, to taste experience to the utmost, to reach out eagerly and without fear for newer and richer experience.” Eleanor, you were a brave woman! So what are you afraid of? Visualize yourself “inside” your dream and start walking toward it. Practice being brave and influence the world around you. Are you exercising the muscle of courage? I couldn’t agree with you more. We’ve all got to practice love, peace and communication in our own circles and watch it multiply. Thanks for reading! Love this post. Like you, I try to deal with my fears. If something scares me – I need to face it or do it (such as most recently crossing the South Pacific whilst crewing on a sailing yacht – open sea for weeks and weeks?! aaaargh!). I find when I deal with the fear that, not only does it lose its control over me, but it also makes me feel pretty good for having had a go! Yes, let’s keep encouraging courage! thank you, for the words about fear, I believe you must have written that to me. what a great way to start my monday with your words. I was listening to an interview with a dot.com guy that had made a bunch o’ money — he said fear got him up in the morning — but not debilitating fear, fear that drives one forward and was a healthy adversary to push up against. there is a fine line. getting on the other side of it. I like also what you said that you analyze and say no that won’t work for me. or yes, I will take that chance. people have to listen to themselves and yes more than anything – being honest with oneself first. Thank you for your thoughtful comments. There is such a fine line; distinguishing between debilitating fear and the fear that pushes us forward. A community of supporters, those that will shoot straight, are so invaluable, but ultimately YOU still have to choose. Stay strong, my friend! Hi, Virginia. Thank you for writing. As humans, we are all so afraid; pathetic little creatures really. But we have a mighty strength inside us as well! In order to develop this little muscle we have to actually exercise it through such seemingly small actions such as meeting new people, going to new places and eating new food! Cheers!